On Wednesday, President Barack Obama once again exposed the irrationality of public school administrators intent on punishing children for imaginative play under overbroad zero-tolerance weapons policies. While attending the United States Coast Guard Academy’s commencement ceremony in New London, Conn., the 44th president took time to pose with some of the graduating cadets. 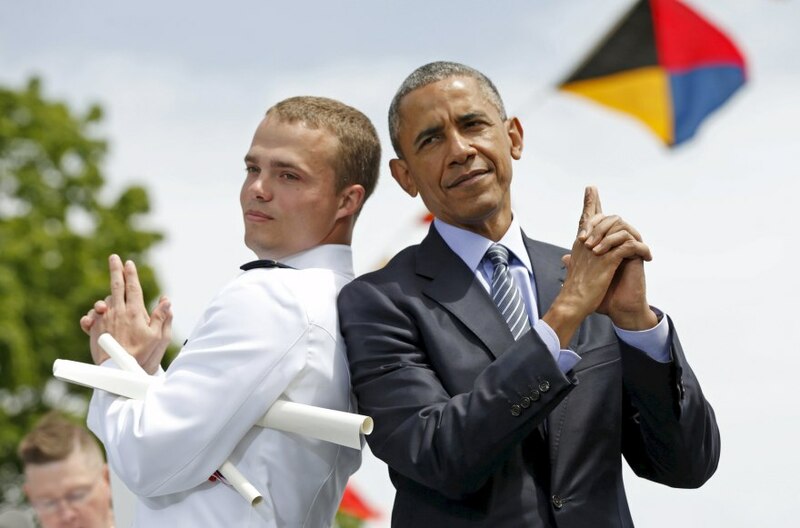 While getting his picture taken with Graduate Robert McConnel, Obama and the cadet struck back-to-back James Bond-like poses--with matching finger-guns in the air. Back in March, we announced that NRA and Obama may have finally found a small patch of common ground, following the president’s use of a finger-gun in an online video promoting the Affordable Care Act. The video illustrated that unlike the most vociferous anti-gun zealots and school administrators, Obama at the very least recognizes that such playful behavior isn’t anti-social or threatening. The hope was that public school officials would take note of the president’s actions, resulting in more reasonable enforcement of school zero-tolerance weapons policies. Obama’s latest finger-gun display reiterates that playful activity involving imaginary firearms is normal and acceptable, even in the increasingly sensitive and infantilized environment of college campuses and national politics. We hope that if asked to opine, the Finger-gun Slinger in Chief would say the same and encourage overzealous school officials to holster their punitive and irrational attitudes.